INFO Monofonik is one man music project based in Zagreb, Croatia, using Roland MC-505 sequencer/synthesizer exclusively for laying musical tracks. Avoiding use of computer in creative process allows for much more 'desk independent' musical creation and presentation, while putting some constraints on final sound. 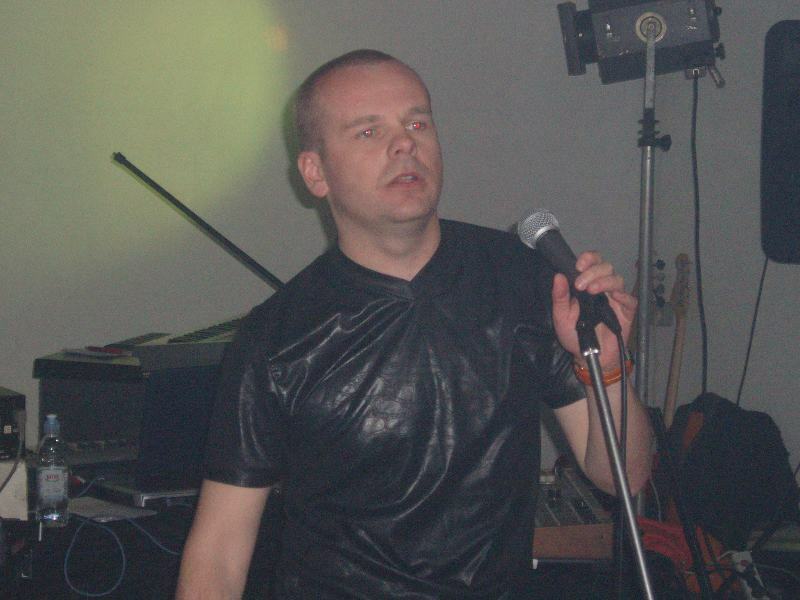 End result is a minimal retro electronic sound with post-punk lyrics on top. Most of the lyrics are in Croatian and You are invited to check them on Lyrics page. While I was being active in different former bands as singer and lyrics author, Monofonik project was started in March of 2004. All music, lyrics, recordings, CD cover and web site design is done by myself. Recordings were done in my home studio using PC as a multitrack recorder. Some of the tracks were presented in Croatian radio shows Prikljucak (Connection) of Radio Rijeka, Elektronski zvuk (Electronic sound) of Radio Sjeverozapad, One Man Music Show and Borderline music of Radio 101, and they were all well received. Many tracks were present on Underground Top 10 of Croatian Vip music site , and Boje ljubavi (Colours of love) ended up at 1st place. Monofonik appeared live at EXIT international musical festival in Novi Sad, Serbia and Montenegro, as part of international Elektrana (Power plant) stage on 9th of July 2005. and then again next year on 7th of July 2006. 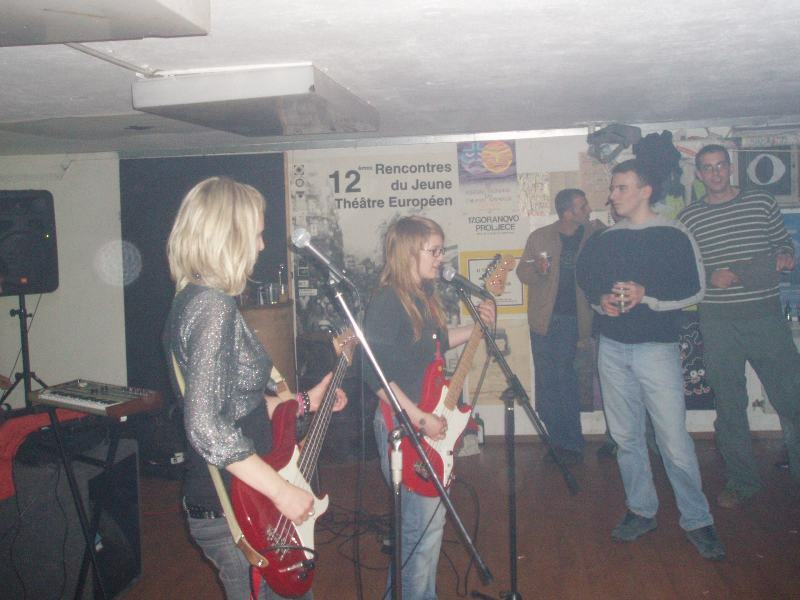 Besides that, there were many other live appearances in Sisak, Belgrade, Rijeka and Zagreb during 2006 and 2007. If You are, by any chance, in posession of Monofonik recordings You are invited to freely distribute them as a whole or convert them in MP3 or other formats but You must retain correct artist and song name and link to this site. If You have any questions, don't hesitate to use my contact mail, but I take no responsibility for damages resulting from listening to Monofonik tracks. 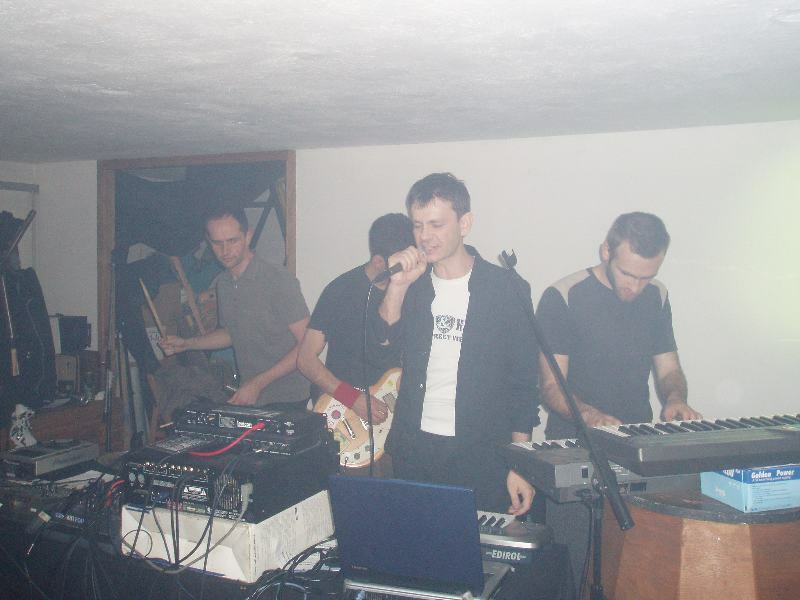 01.03.08 - Monofonik enters Year 2008. with new EP named Vatra (the fire). EP also contains new songs Good Night and Arbeit. CD cover is designed by Nieuw NDG. You can listen to a song Good Night on Music page. Song Arbeit is available for listening on mine Myspace page. 01.11.07 - Monofonik appeared live on 24th of October 2007. at Zagreb Film Festival right after Croatian premiere of movie Control (life and death of Ian Curtis, author and singer of Joy Division). Monofonik rendition of Joy Division songs Love will tear us apart, Digital and She's lost control were played. Audience reaction was really great as You can see on two videos uploaded to my Youtube channel: Song about love and Sjene (Shadows) . 10.10.07 - new track Sjene (Shadows). You can listen to it on Music page. 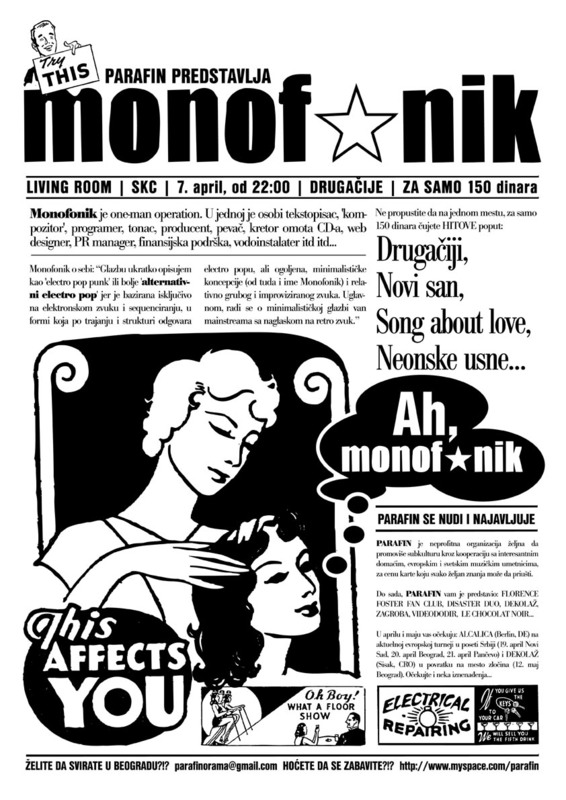 30.09.07 - Monofonik appeared live in Rijeka on 29th of June 2007. at Discordia club with young talented band from Rijeka Klaus and it was great thanks to fans from Zagreb, Sisak, Rijeka, Opatija... who were there to give support :). At Youtube you can watch two videos recorded during that concert: Klaus and Monofonik. 21.06.07 - track Paris 2005, inspired by unrests in Paris, is now redone in more aggressive style. It is in Croatian, with news clips in English and refrain in French (!). You can listen to it on Music page. 16.04.07 - Monofonik appeared live in Belgrade on 7th of April 2007. at Living Room (SKC) thanks to Parafin non-profit organisation. At Youtube you can watch two videos recorded during that concert: Brain Vasectomy and Song about love. 12.03.07 - New track, this time in English :) - Brain Vasectomy is available for download at Music page. 10.01.07 - New track in Croatian called Tvoje ime (Your name) is available for download at Music page. 22.09.06 - Thanks to my very good friend Independent Saint you can hear my song Novi san (New Dream) in his club mix version, and it sounds great. You can hear it on Music page. 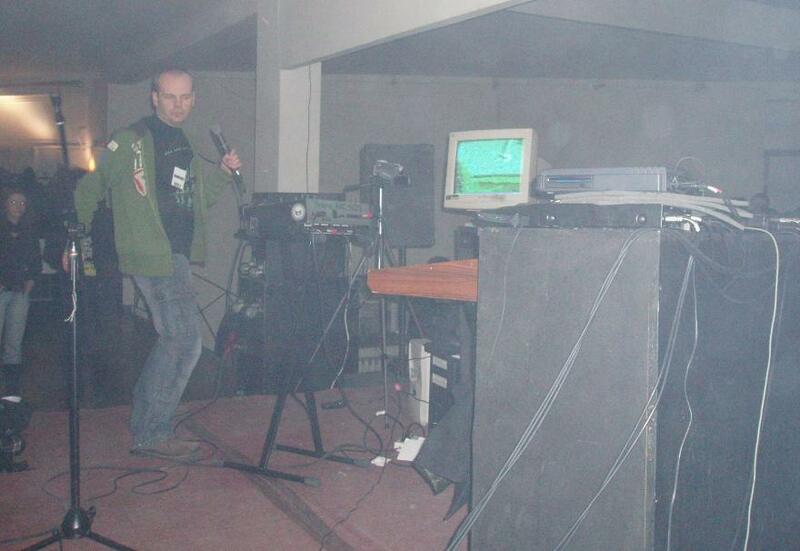 07.07.06 - Monofonik appeared live at EXIT international music festival in Novi Sad, participating at Elektrana stage. Thanks to all that came and danced with me ! 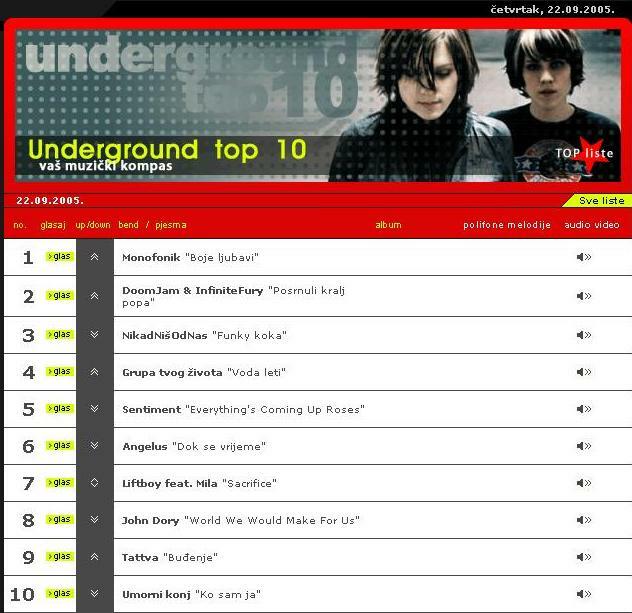 10.06.06 - Neonske Usne (Neon lips) are currently at 2nd place on Vip Music Underground Top 10 ! Thaks to all who voted ! 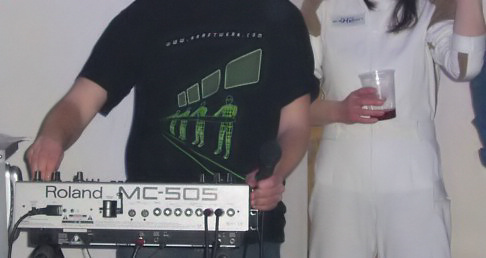 03.06.06 - Monofonik appeared live at electronic book promotion in Daskalishte, Sisak. Book is called Peeping Tom by Aun Crie. 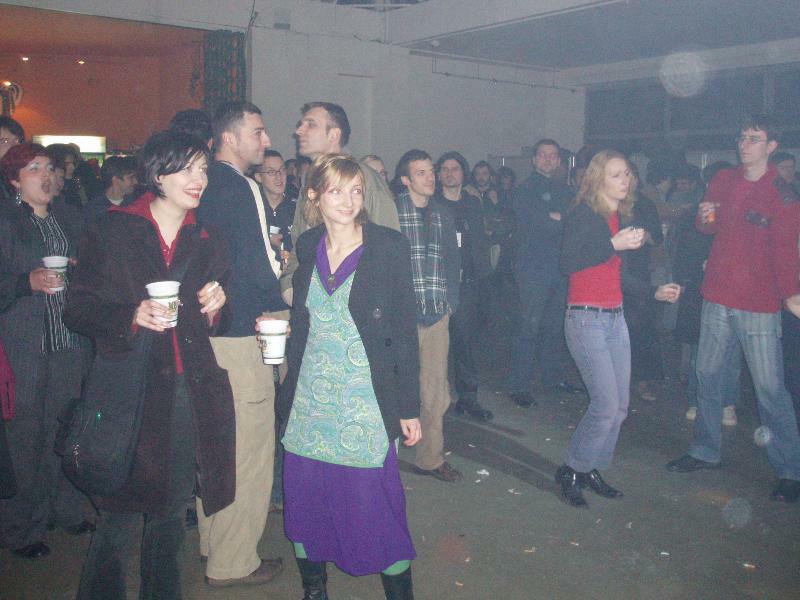 Also, Monofonik will appear live at this years EXIT festival in Novi Sad on 7.7.2006. See you there. A few pictures from Sisak: Monofonik Lollobrigida Florence Foster Fan Club Aun Crie Videododir Apparatchik Solist Thanks to Nieuw NDG for design of CD promo cover. 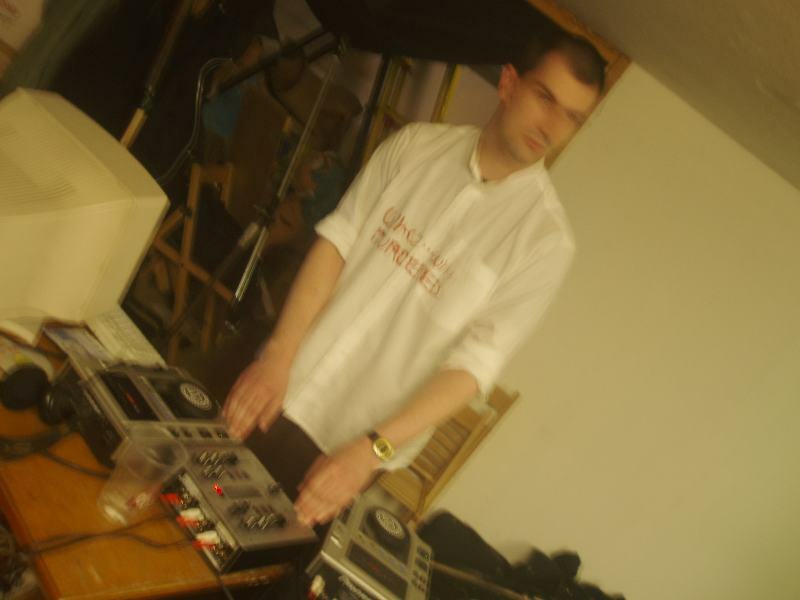 08.05.06 - New track Electro City, inspired by town of Sisak, in three versions. You can download Electromech version featuring Microsoft Sam at Music page. 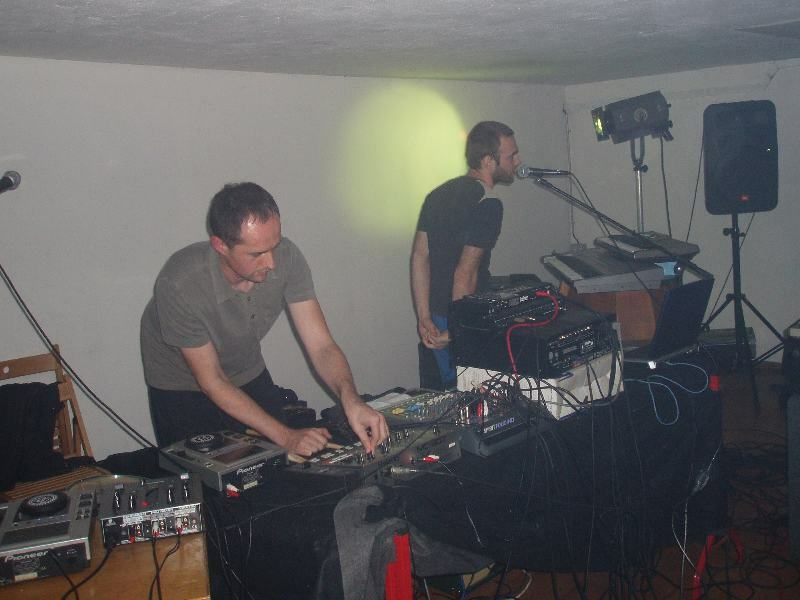 29.03.06 - two new tracks Neonske usne (Neon lips) and Mjesec (The Moon), influenced by electro sound, both in Croatian. Neon lips comes in two flavoures: 'normal' and full vocoder version. I decided to upload full vocoder version on my Music page. 17.01.06 - new single Song about love - a trip to catchy pop waters with lyrics in English. Single also contains a new instrumental track Adios Cuba. Title track Song about love is available on Music page. 22.12.05 - this is a part of year when everybody gives away something so I decided to upload one old but still good track Energija. Enjoy here :) Music . 15.11.05 - new track Novi san (New dream), in Croatian, You can listen to it on Music page. 20.10.05 - new track Svijet u meni (World inside me), in Croatian, You can listen to it on Music page. 22.09.05. 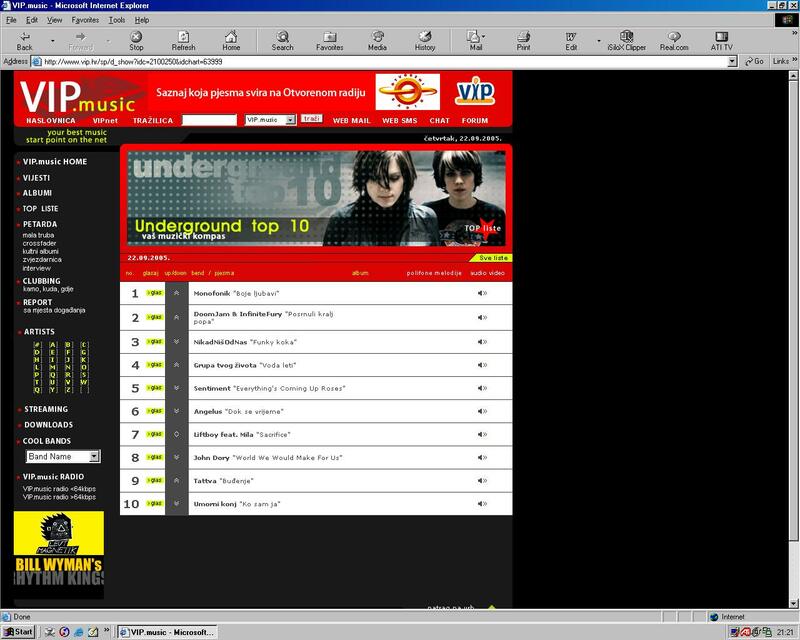 - Boje ljubavi (Colours of love) managed to get to the 1st place on Underground top 10 at Vip Music site ! Thanks to all of You who voted ! 10.09.05 - Monofonik recently became a member of Technopopmusic.com . Visit to browse through all Technopomusic.com artists. 12.07.05 - Monofonik appeared live at EXIT5 and received a very warm welcome from the audience. Thanks to all who were there to support me. 15.06.05 - new single Boje ljubavi (Colours of love). Listen to the title track on Music page. Single also contains tracks Kultura nasilja and Ljubav/Pulse.